Don’t tell him I told you this, but sometimes I think my husband is scared of our daughters. You’d think they were adorable pink monsters that are going to smother him with dolls, dresses, and princesses until all the manliness has been sucked out of him. I don’t know when the “girly girl” phase kicks in for some kids, but it certainly hasn’t yet for us. Layla will throw a ball, play rough, and roll in the dirt with the best of them. She loves all sports, especially ones that Daddy likes to watch, so I had to get her prepped and ready for the marathons of football watching that are about to begin. Coordination isn’t our strong suit currently, so I decided to create an activity that could benefit Layla in that area. Hand eye coordination is a tough skill, and throwing this ball through our field goal post was harder for her than I thought. 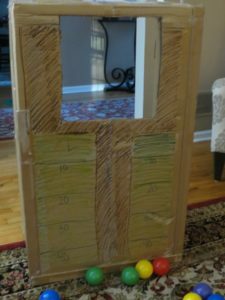 If you use this game give them some leeway (notice Layla practically standing on top of the box for the first few throws, than gradually moving back). Prepare for some frustration, but they will get it! We choose to use lightweight balls from our ball pit to toss- but any ball that your child can hold in one hand would work- even bean bags would be a great option! Creating this game was a cinch. We had a huge box laying around from a recent purchase. Saj cut a rectangle out for our field goal, than I took some markers and got to work. Drawing the field took all of five minutes, you don’t need to get fancy with this, and lets be honest- if you do its more for you than your kids (and thats ok, who doesn’t love pretty things?). I probably didn’t need to draw anything on this box and Layla still would’ve loved it. Cut down your box to get rid of anything you won’t be using (I took the flaps off and cut the back down slightly). Pre-draw your field goal as a guide for where to cut. Using a box cutter, cut down from the top of the box to create an open rectangle. Once the box is cut decorate it to look like a football field. I’d recommend practicing throwing the ball BEFORE you take the box out. Layla was so focused on getting it through the hole that she didn’t want to listen to our advice on how to throw it. 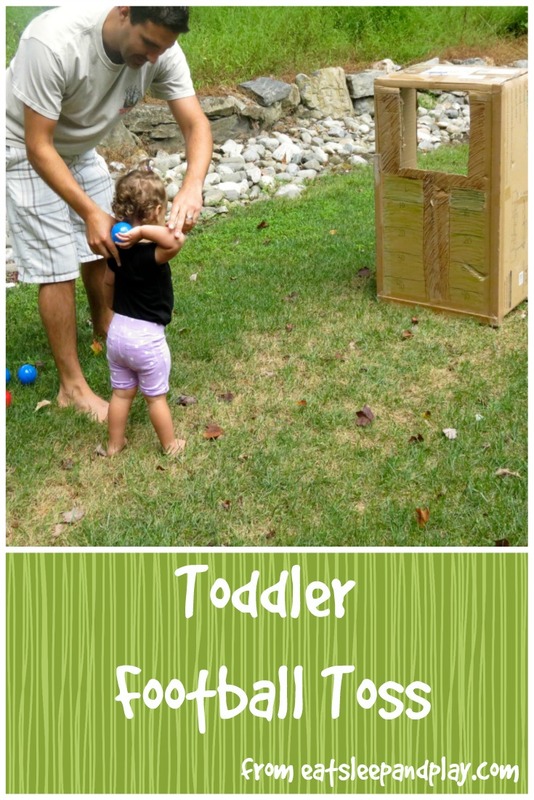 Have your child stand a foot or so back and toss the ball through the hole. YES I KNOW GUYS, you don’t throw a ball through a field goal- but we’re going to for the sake of fun. Once they have gotten the hang of it, challenge them to step back a few feet and try it again! We also used the board to talk about football and what you see on a football field. 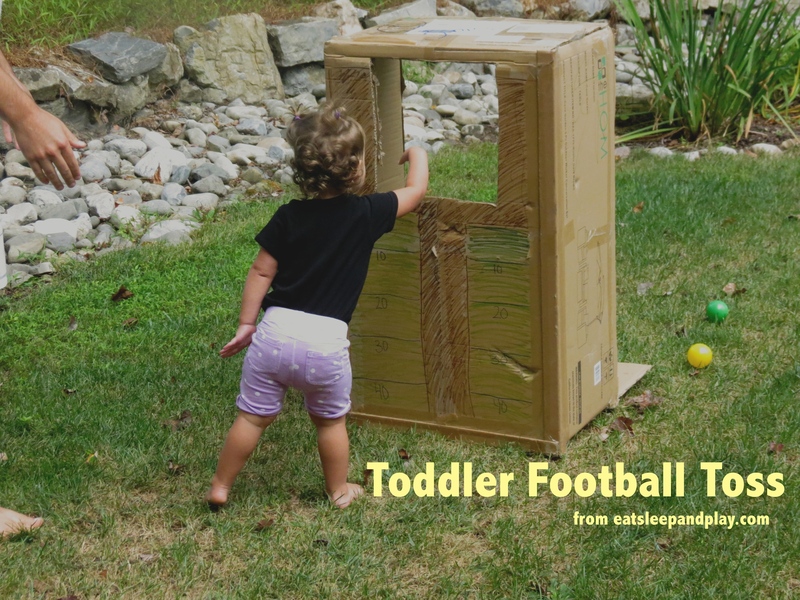 Share with us- Does your family watch football? Who are you rooting for, and what are your game day rituals? I love this! Such a cute idea! How do you think up all this great stuff? !